Snagglebee, you are so skillful !! I wonder. Your patcher worked in Windows 7 64bit with which I enjoyed the game. Could you devise new patcher working in Windows 10 64bit ? I would like to play R2 in Windows 10 64bit. Thank you. I got it worked in W10. BTW could you tell me how I can make CD image of Rayman 2 with Alcohol 120%, i.e. which option should be chosen in image making wizard starforce or securom or other ? IIITA wrote: could you tell me how I can make CD image of Rayman 2 with Alcohol 120%, i.e. which option should be chosen in image making wizard starforce or securom or other ? Rayman 2 uses SafeDisc. If you are unsure about other disc protected disc, you can use the included Disc Type Analyser located at the bottom next to the Web icon on the Imageassistant window. Be prepared for a looooooooong ripping time. I got R2 copyed in "Safedisk" option with Alcohol 120% successfully, taking 20 minutes or around with x4 reading speed. The game is now working along with the CD image mdf mds in Windows 10 using the files copyed from CD that Carrot-master suggested to me in the previous post !! Yeah ! Thank you Snagglebee !! I was too sad not able to play Rayman 2 so I was searching a patch for the Win7 problem for several hours... and the solution was on the english forum of the PC... I should come here more often haha ! I had the original CD, I just wanted to use it and play ! No emulator, no GoG ! Just Snagglebee ! I found that Rayman 2 can be installed normally from game CD to Windows 10 Pro 64bit as of 22 Feb. 2016. Then with game CD in the drive, started the game with Rayman2.exe with the compatibility to "Windows98/ME". Booyah !! Last edited by IIITA on Wed Jun 29, 2016 7:25 am, edited 3 times in total. IIITA wrote: I found that Rayman 2 can be installed normally from game CD to Windows 10 Pro 64bit as of 22 Feb. 2015. Rayman Arena/M work fine just as well! I saw that the new file of this patcher has been removed. Can you upload this again? So, when I start rayman 2 game, a strange window apperaed http://i.imgur.com/DkorikS.png?1 I am from Poland I translated it and I know that the text tells:"Problem with startup. No system memory". I checked the GXSetup.exe and it shows : http://i.imgur.com/0vQ023A.png . The square with "Can use system memory " and "Can use AGP memory" are with the "x" . Maybe this is the problem. How to mark this square? Clicking on this squares doesnt work!!! Try running as admin. The game may not have the correct permissions to use your systems memory. The boxes in the setup can't be checked or unchecked as it's just to display the settings rather than giving you the option to change them. Later I found the torrent with GOG Game Rayman 2 ,I installed it and it works! Karno wrote: So, when I start rayman 2 game, a strange window apperaed http://i.imgur.com/DkorikS.png?1 I am from Poland I translated it and I know that the text tells:"Problem with startup. No system memory". I checked the GXSetup.exe and it shows : http://i.imgur.com/0vQ023A.png . The square with "Can use system memory " and "Can use AGP memory" are with the "x" . Maybe this is the problem. How to mark this square? Clicking on this squares doesnt work!!! Aamm "Brak pamięci systemu" means ”System out of memory" in English. Did you run GXSetup.exe with compatibility "WindowsXP SP2" as I did ? Please, is still possible to obtain the patch? I have my old Rayman 2 CD, but I can't play it on my Windows 8 64 bit. Guitarist wrote: Please, is still possible to obtain the patch? I have my old Rayman 2 CD, but I can't play it on my Windows 8 64 bit. So you "have installed" R2 but could not run it, could you ? This patcher is for INSTALLATION , and has nothing to do with "could not play R2". Once you already installed the game, the issue you have is caused by another reason. 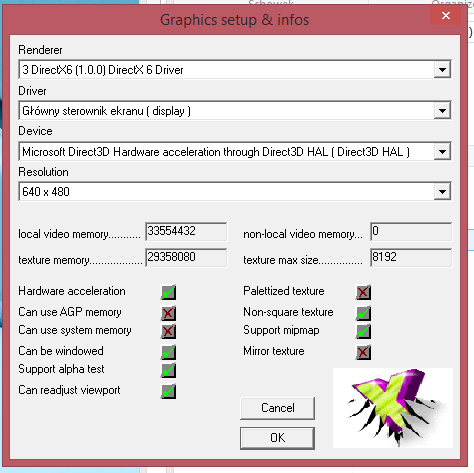 Did you run GXSetup.exe with its compatibility "WindowsXP SP2" before you launched Rayman2.exe to set up DirectX for it ? I forgot to tell one more thing about ubi.ini file. The file was made in \Windows\Ubisoft folder as you run GXSetup.exe to set the game play. But the file should be in the game installed directory when you play in x64 bit OS such as Windows 7/8/10 x64 although it was made in \Windows\Ubisoft folder. So after GXSetup run, you should copy and paste the file into the game installed directory. Last edited by IIITA on Sat May 13, 2017 12:19 pm, edited 2 times in total. It's basically impossible to play the original CD R2 on Windows > XP without getting that blasted pirate head anyway, isn't it? Any chance someone can upload the patcher? Everytime during the installation process on my Windows 8.1, it freezes at 21%, and then I have to close it out. PluMGMK wrote: It's basically impossible to play the original CD R2 on Windows > XP without getting that blasted pirate head anyway, isn't it? It wasn't the case for me back when I had Windows XP. I said Windows > XP, not Windows ≥ XP. I suppose "≥ Vista" would've been clearer, but I guess my brain just couldn't put the words "great" and "Vista" that close together. Ah yes, you are right! Still, I use Windows 7 and I never had issues with the skull.